This lightweight, self-priming, portable pump with stainless steel pump head can be used to transfer water to an RV, pump out boat bilges, pump out stock tanks, and in other applecations where water needs to be transferred. Intemittent duty is 15 minutes "ON" and 45 minutes "OFF". 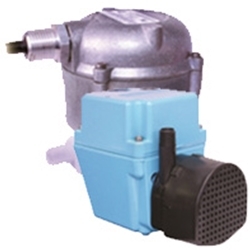 Submersible pump for use with stoddard solvent and deodorized kerosene submerged parts washer applications only. For pumping unheated metal parts cleaning solvent that is UL classified as PJQU, as described in the Gas and Oil Equipment Directory. These refined petroleum distillates are free from tendency to heat spontaneously; they have a closed cup flash point not lower than 100 degrees F.
Submersible pump for use with stoddard solvent and deodorized kerosene submerged parts washer applications only. For pumping unheated metal parts cleaning solvent which is UL classified as PJQU, as described in the Gas and Oil Equipment Directory. These refined petroleum distillates are free from tendency to heat spontaneously; they have a closed cup flash point not lower than 100 degrees F.
Designed for submerged use only, this pump is intended for use in UL-listed parts cleaners. For pumping unheated metal parts cleaning solvent which is UL classified as PJQU, as described in the Gas and Oil Equipment Directory. These refined petroleum distillates are free from tendency to heat spontaneously; they have a closed cup flash point not lower than 100 degrees F.
Small submersible oil-filled pump with epoxy coated cast aluminum housing. For commercial, industrial and home applications including statuary fountains, water displays, air conditioners, machine tool coolants, and many other applications where liquid must be transferred or recirculated. This compact 300 GPH pump features a 1/4" MNPT discharge, 11.8' shut-off head capability, and screened inlet. snap-off screen for easy cleaning.